A march into arena for the quarter-finals of the Women’s event at the Liebherr 2018 World Team Championships in Halmstad started proceedings on the morning of Thursday 3rd May, for the selections from the Democratic People’s Republic of Korea and from Korea Republic. Ready for action but there was no action; the players shook hands, greeted each other and smiled glowing in the best interests of friendship. The two teams did not relish the possibility of facing each other for a place in the semi-finals; discussions prior to the penultimate round encounter resulted in agreement between members of both the DPR Korea and Korea Republic delegations alongside the International Table Tennis Federation that a Unified Korea will progress to the semi-final stage. At 11.00am on Friday 4th May they will meet the winners of the contest between Japan and Ukraine. It is a move which has delighted Thomas Weikert, ITTF President. The decision follows the country’s leaders’ pledge for “lasting peace” on the Korean Peninsula issued last week. Moreover, it portrays that table tennis is the perfect medium for promoting peace through sport. Like, Thomas Weikert, Ju Jong Chol. President of the Table Tennis Association of the Democratic People’s Republic of Korea, welcomed the decision. Undoubtedly it is a moment in history, one that Korea Republic’s Ryu Seungmin, the Athens 2004 Olympic Games gold medallist and member of the International Olympic Committee applauded. It has been a significant year for the two Korean countries in joining forces. They made history by marching together at the 2018 Winter Olympic Games earlier in the year in Pyeongchang, a most significant sign of unity. It is thanks to the International Olympic Committee that the Democratic People’s Republic of Korea is participating in Halmstad. They received Olympic Solidarity support. 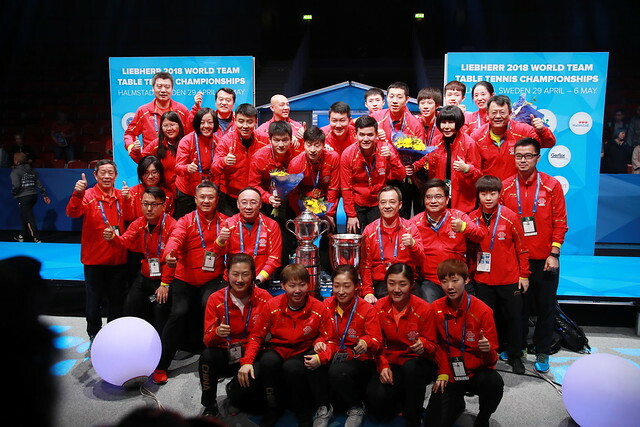 Significantly, it is the first that Korea will have played as a unified team since the 1991 World Championships in Chiba when Hong Cha Ok, Hyun Junghwa, Li Bun Hui and Yu Sun Bok combined to win the Women’s Team title; the silver medallists being China who selected from Chen Zihe, Deng Yaping, Gao Jun and Qiao Hong. It is an event An Jaehyun, the coach of the Korea Republic Team remembers. Later in 2012 directed by Moon Hyunsung, the celebrated event was produced as film named “As One”. In Halmstad the players representing Korea Republic are Jeon Jihee, Kim Jiho, Suh Hyowon, Yang Haeun and Yoo Eunchong; for DPR Korea it is Cha Hyo Sim, Choe Hyon Hwa, Kim Nam Hae and Kim Song I. The five players who will form the Unified Korea Team will be advised shortly.